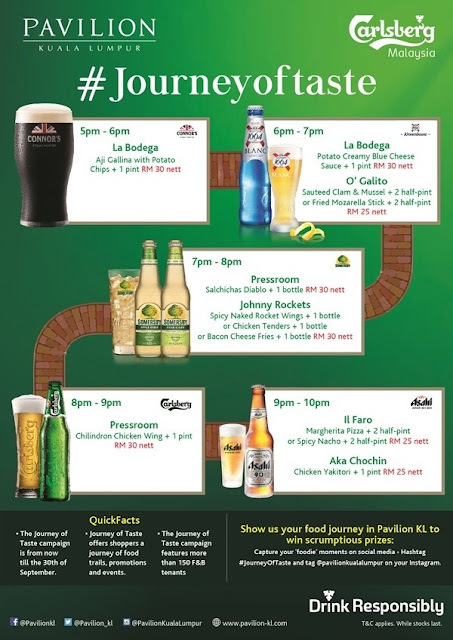 Have you join Journey of Taste (#Journeyoftaste) that organised by Pavilion Kuala Lumpur before? The Journey of Taste campaign is from now till end of this month, September 2015. You able to have a journey of food trails, promotions and events when you participating or joining this campaign, Journey of Taste. Are you ready for the Journey of Taste? There will be over 150 F&B tenants, dedicated gourmet hall, spacious restaurants with private rooms and also VIP dining concierge. I feel that this campaign really suits across all age groups and able to experience dining option with all occasions. Have you heard or experience Food and Beer pairing before? For me, this is something new and I really would like thanks Pavilion Kuala Lumpur & Carlsberg Malaysia for this arrangement. My first Journey of Taste at the La Bodega to try out the Connor's Stout Porter with Aji Gallina with Potato Chips. I do like the crispy of the chips and the Connor's Stout Porter is perfectly balances with the right bitterness. This great combination is only RM 30 nett. Time to continue my Journey Of Taste to the O' Galito. I fell that the Kronenbourg 1664 is really give a refreshing taste. The Kronenbourg 1664 with fresh sauteed clam & mussel or fried mozarella sticks and bruschetta for only RM 25 nett. Highly recommended. Time to try out the Somersby at Johnny Rockets at Pavilion Kuala Lumpur. The Somersby Apple Cider or the Pear Cider is really refreshing and really taste sweet with no beer after-taste. Not only that, you should request the Somersby to served cool. I really like the combination of the Somersby Apple or Pear Cider with chicken tenders and sandwiches and this only costs RM 30 nett. Highly recommended. My #JourneyofTaste continue to the Pressroom at Pavilion Kuala Lumpur. This time I'm going to try out the Chilindron Chicken Wing with Carlsberg. Basically the chicken wing is really tasty and spicy and time to chill out with the Carlsberg. Seriously, I do like this food and beer pairing for only RM 30 nett. Highly recommended. My last pit-stop (#JourneyofTaste) will be at the Aka Choclin to try the Asahi Super Dry. This will be my first time try out the Asahi Super Dry. I been told that the Asahi Super Dry is the Japan No.1 Beer. I feel that the Asahi Super Dry really refreshing and most important no bitter after taste. You can try the Asahi Super Dry with Chicken Yakitori or Salmon Sushi for only RM 30 nett. Highly recommended. Basically, all the outlets for the #JourneyofTaste is really nearby and you actually could hops from an outlet to another outlet within a minute. It really a good experience for me and I feel that you all should have a try too. A perfection pairing food and beer that you should not missed out when you reach Pavilion Kuala Lumpur. Remember if you drink, don't drive. More and more #JourneyofTaste event for you to participating. Visit www.pavilion-kl.com for latest update. Once again, I would like to thanks Pavilion Kuala Lumpur & Carlsberg Malaysia for this awesome #JourneyofTaste event.